We acknowledge the traditional owners of our lands and pay respects to all Elders, past and present. Sugary drinks have too much sugar in them. 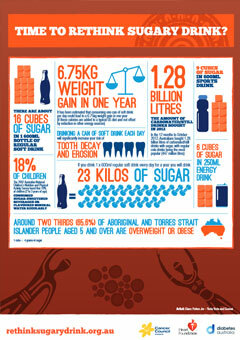 We know our mob drink heaps, with more than half of us drinking sugary drinks almost every daya. 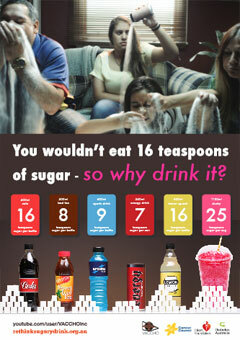 All that sugar can make you gain weight which may lead to type 2 diabetes, heart disease and some cancers. We've created a collection of resources and campaign materials for our Community. Together we can make a real difference to the health of our people. 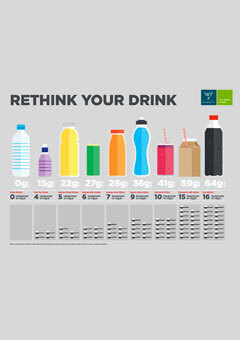 Everything on this site you can use to help cut out sugary drinks for you, your family and Community. 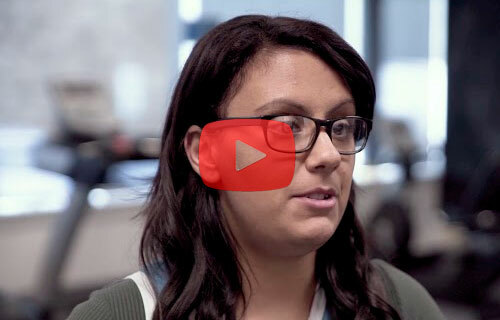 Go on – take the challenge! 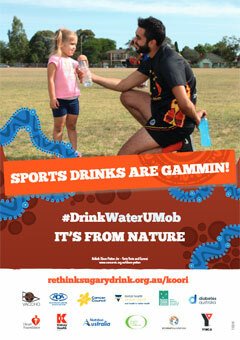 Get healthy and take the pledge by going sugary drink free to receive a free box of #DrinkWaterUMob drink bottles. Download the expression of interest form now. 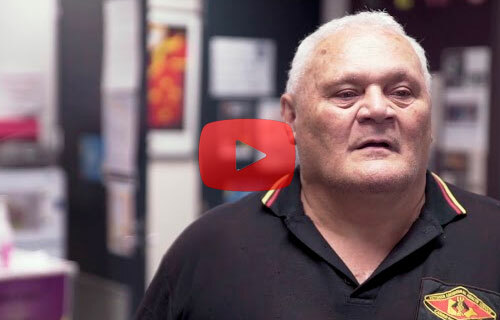 Wathaurong Aboriginal Co-Op have partnered with Spark Health to bring I Dare Ya, a brand new health and well-being program, to life in the Geelong region. Throughout this six week program we will be taking on Six Deadly Dares together that will give us simple and sustainable tools to kick-start and keep a healthy lifestyle. Everyone is welcome to join I Dare Ya! We love seeing kids taking part in programs, it's never too early to start those healthy habits! Kids under 16 years of age require a guardian to supervise their participation. Each week we will take on a different health topic to help us reach our goals before getting moving. We have something for every fitness level. Storm Health and Fitness: Our vision is to use movement therapeutically to create spaces for our community to become stronger and healthier to create lasting positive change. To do this we need to and we do encourage all of our members to drink water and abstain from sugary drinks so they can achieve their health and fitness goals. I coach them all the time about the importance of water in achieving optimal health and weight loss. 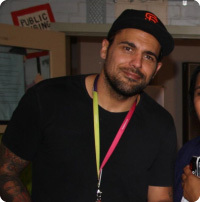 Victoria Police Bendigo & Echuca: In my program I am the Aboriginal Community Liaison Officer for the Division 5, I work with youth at risk and plan and run events across the division. We have multiple events that we will be running over the next 6 months that will be encouraging the mob to stop drinking and also family violence meetings and we would like to distribute these across the division. We plan on using these on our youth days and camps to assist us to encourage these youth to give up alcohol and sugary drinks and to improve their way of life. 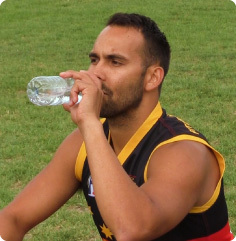 Mallee District Aboriginal Services: As part of maternal and child health consults regularly advice regularly importance of water and reducing or cutting out sweet drinks. 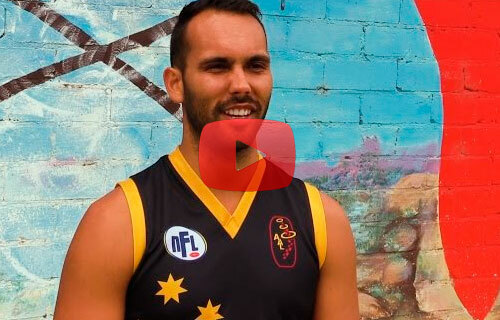 The Centre of Excellence for Aboriginal Health in Gippsland conducts two camps per year. Camp Marook promotes healthy living, health careers and provides activities which increase knowledge and wellbeing. We target primary school children who are interested in learning and participating in activities which teach them about not smoking, eating healthy, healthy activities and career knowledge of health careers. Luke Sultan used to drink Coke a couple of times a week without thinking about how much sugar it contained. Now he doesn't drink Coke or other sugary drinks at all – and he feels great for it. The 39-year-old who is originally an Eastern Arrernte and Gurindji man from Central Australia says his health and a desire to lose weight motivated him to cut back. 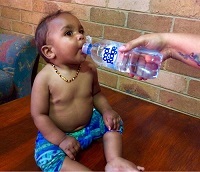 #DrinkWaterUMob competition Congratulations to Natashia who won the previous #DrinkWaterUMob competition with this picture. 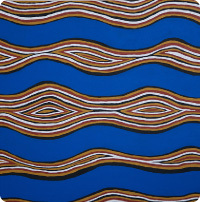 You'll be seeing this amazing piece of work on our promotional products, supporting our positive water message with Cultural strength.